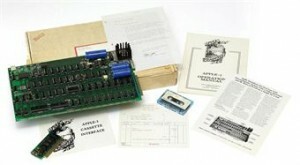 In September a Apple 1 computer with a few accessories sold for $23,000. Christie’s has just auctioned off an early (first run) Apple 1, with invoice, shipping box, letter from ‘Steven Jobs’ and many accessories for a staggering $213,600. This would have been one of the original PCB’s, sold without components and later assembled by someone else. The main CPU is of course a 6502 but in this case a R6502P by Rockwell made in late 1981. What made this one so much more valuable? The documentation and original box. Whoever bought it should however replace the CPU with a white ceramic MOS 6502 to preserve the beauty of the original Apple 1.